This is the second of four reviews scheduled for Tuesdays in March. Each review will cover one of the first four volumes of the South Carolina Regimental-Roster Set series from Broadfoot Publishing Company. A significant portion of each review will show you how this particular volume compared to the others in the series in terms of regimental history length, amount of annotation, depth and print size of rosters, bibliography, illustrations, and maps. I do this to show readers just how different each volume can be. The South Carolina Regimental-Roster Set bears a striking external appearance to the H.E. 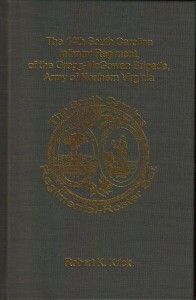 Howard Virginia Regimental Histories series. These books were, in fact designed as a South Carolina answer to the Virginia unit histories. Broadfoot hopes to publish 50 volumes in this set, but that plan is dependent on how well these and subsequent books in the series sell. If you are interested in seeing this entire series printed, I encourage you to pick up these volumes immediately rather than put off purchases until later. Krick, Robert K. The 14th South Carolina Infantry Regiment, of the Gregg-McGowan Brigade, Army of Northern Virginia. Broadfoot Publishing Company (2008). 311 pages, roster, illustrations, bibliography, index. ISBN: 978-1-56837-408-6 $35.00 (Hardcover). Well-known Army of Northern Virginia historian Bob Krick, author of many books on that famous Confederate army, here chronicles the wartime service of the 14th South Carolina in a concise regimental history. The main focus of The 14th South Carolina Infantry Regiment, of the Gregg-McGowan Brigade, Army of Northern Virginia is squarely on the voluminous and informative roster, covering all 1560 men who served in the regiment. The 14th South Carolina, considered by some to be the best regiment in A.P. Hill’s famous Light Division, served honorably and ably with the Army of Northern Virginia in all of its major battles. The regiment, first mustered into Confederate service in the summer of 1861, was initially assigned to coastal duty and brigaded with the 12th and 13th South Carolina, all under the command of Maxcy Gregg. The 14th and her sister units were moved to the Richmond area in June 1862 in response to the union threat against the Confederate capital. From that point forward, the 14th was engaged in a variety of difficult fights, none more so than the desperate struggle for the Mule Shoe salient at Spotsylvania Court House on May 12, 1864. After Gregg was killed at Fredericksburg, Samuel McGowan led the brigade of South Carolinians off and on for the rest of the war, and they surrendered with Lee at Appomattox. Krick’s regimental history for the 14th was much shorter than I expected at only 28 pages. An interview with Broadfoot Publishing owner Tom Broadfoot, which will appear later this month, confirmed that the author was asked to write a short sketch rather than a fully fleshed out regimental history. Although some strength and casualty figures are mentioned, all battles were not covered in this way. Specific details of what the 14th South Carolina did in each battle are also lacking to some extent, especially when compared to the other three initial volumes in the series. These descriptions are also not as detailed as many books by Mr. Krick, including the excellent Stonewall Jackson at Cedar Mountain. The author’s writing style, as is typical, made for an entertaining read. The following quote about Maxcy Gregg on page 13 was especially enjoyable: “Gregg died unmarried despite being somewhat deaf, and thus peculiarly well equipped for coping with that circumstance.” There were no maps to accompany the text, a disappointing omission. Several illustrations near the end of the regimental history added some value to the book. Surprisingly, the book contains no notes in the typical style, the only book so far in this series which isn’t annotated. To be fair, many entries in the roster have a brief mention at the end which cites a book from the bibliography at the end of the book, which does somewhat make up for this omission. Clearly the main focus of The 14th South Carolina Infantry Regiment, of the Gregg-McGowan Brigade, Army of Northern Virginia is the massive amount of information contained in the roster. And here it shines. The CSRs (compiled service records) of each man in the National Archives were used as a main source and combined with other research to provide what are hoped to be the most detailed rosters for South Carolina regiments ever created, including pre-war and post-war information. The roster is rendered in large print which makes it quite easy to read, as you can see in a recent brochure from Broadfoot. The roster of 1560 men is not organized by company. Instead, the entire regiment is listed in alphabetical order by last name, with the company information being the first thing listed for each man. The 14th South Carolina Infantry Regiment, of the Gregg-McGowan Brigade, Army of Northern Virginia contains the most complete roster of the regiment you are likely to find, fulfilling the main goal of the book as a part of the South Carolina Regimental-Roster Set. The regimental history was not as complete and was meant more as a brief sketch of the unit. 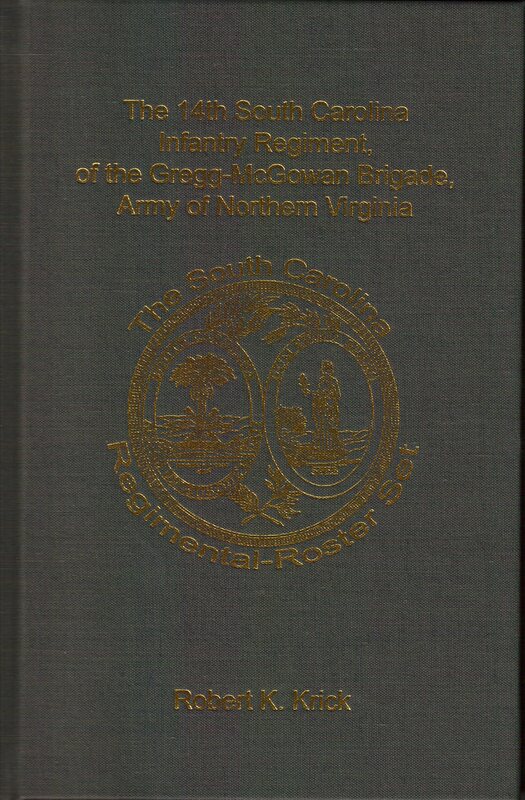 I highly recommend the book to researchers of South Carolina regiments and the 14th South Carolina in particular. Those who have ancestors who fought in the unit will also find this particular volume to be of value. Readers looking for a detailed regimental history of the 14th South Carolina will probably want to look elsewhere. Previous post: Three Weeks Remain in TOCWOC’s The Rifle Musket in Civil War Combat Book Giveaway!